Here, the route consists of three segments namely controller, action and an optional id. This works well for many applications. However, at times you may not have idea about the exact number of route segments involved. Consider the following example. As you can see from the above URLs, one could specify any number of cities in the route segments. Obviously you can't have a route pattern with a known number of segments. Luckily, ASP.NET MVC allows you to use what is often called catch-all route parameter. Let's see how it can be used in this situation. Create a new ASP.NET MVC application and open its RouteConfig.cs file. Then add the following MapRoute() call after the default route pattern. Notice that the route pattern consists of four parameters namely controller, action, country and *cities. The *cities does the trick for us. This catch-all parameter indicates that any number of route segments can follow the country segment. Also notice that the route is configured to be handled by the GetData() action of the HomeController. The catch-all parameter must appear as the last segment of a route. The GetData() action takes two parameters - country and cities. Note that names of these parameters must match with the names of the route parameters defined in the RouteConfig.cs. Capturing and using the country parameter is quite straightforward. The cities parameter could be a single city or multiple cities in the form city1/city2/city3. So, you need to split this string to get an array. Once you do that you are free to process the country and city values as per the application's logic. In this case you simply pass them to the GetData view through the ViewBag. The Index view simply renders a few links with USA as the country and some combination of cities. The GetData view simply displays the country received in the controller and also a list of cities received from the route segments. The following figure shows a sample run of the application. 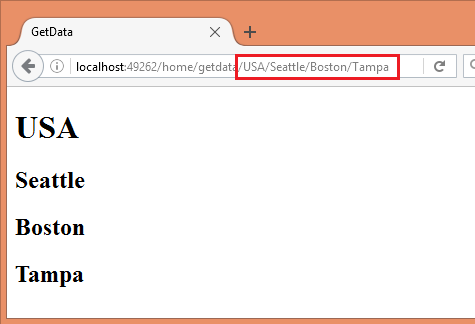 Notice how the URL segments and the output of the view shows the country and cities. That's it! Keep coding ! !